Today’s felting tutorial includes both wet and needle felting. This project spells out my daughter’s name with an individual wet felted ball for each letter of her name. I chose Raven’s name to illustrate this project because she is very interested in learning the spelling of her name and I thought these felted letter balls would be a fun way for her to practice that task! Choose the name of a beloved friend or family member and use it for educational purposes or simply to decorate a nursery. They would look very adorable propped delicately upon a high shelf in a baby’s room! Now let’s begin. You will need wool roving, felting needles, a safe foam/brush surface and an old pair of pantyhose. First, create one wet felted ball for each letter of the name chosen. 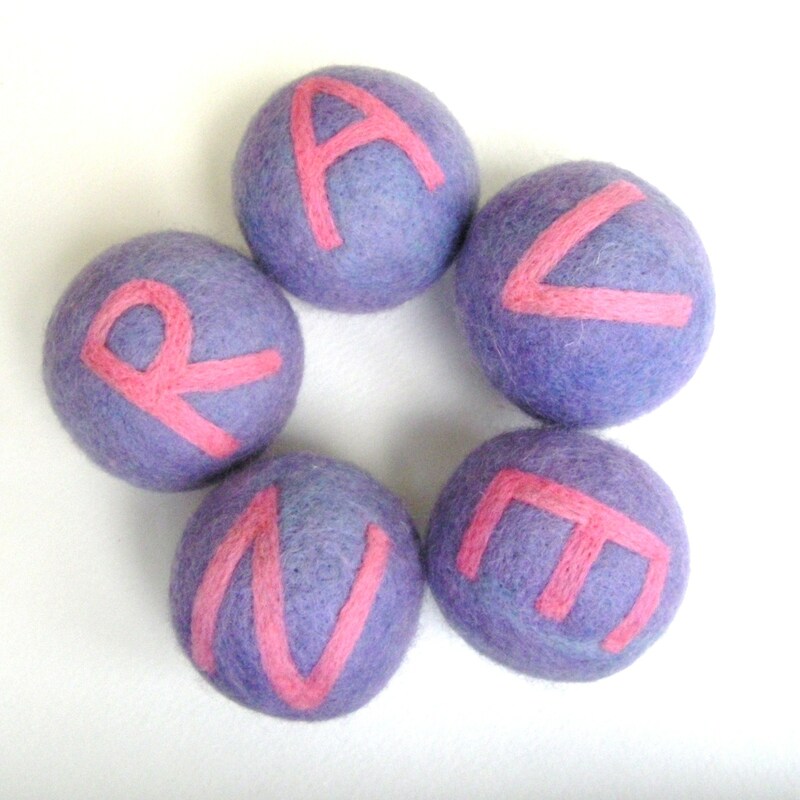 In my case, I needed 5 wet felted balls for the name “RAVEN”. The balls should all be approximately the same size. A balance scale or a digital scale could come in handy here. Each one of my balls started with about 0.4 oz. of white wool. The balls will be slightly smaller than a tennis ball at that weight. Follow my tutorial on wet felted balls and then return here to see the rest of the process! Next, cover the white wet felted balls with the color of choice, I chose lavender. To do this, wrap the white wet felted ball with the colored wool and lightly needle felt it into place. You can completely needle felt the color onto the white ball, but I was very busy with my children and being it was laundry day(as it is every day) I decided to wet felt them once again to firmly adhere the lavender outer color onto the white wool core! Now that the felted balls are colorful, it is time to plan out the letters. Using straight pins write out each letter on a separate ball. Be careful that the straight pins are not at an angle because you will be felting around them next. To demonstrate felting the letters, I will be using the letter A. Choose a color that complements the main color and stretch the wool into a thin line by slowly pulling it apart. I used a Clover Pen loaded with two needles as it helps keep straight lines as you felt; however, one felting needle can be used as well! Line up the thin tuft of wool along one side of the straight pins and needle felt it into place. Continue this process, until the outline of the letter is complete. Don’t forget the inside parts of the letter like in the letter “A, B, or R”. After the outline is complete, remove the straight pins and needle felt between the outline as if you were coloring. One last step left: simply go back over the entire ball with a smaller felting needle(a larger number) to give it a nice finish. This is how the finished name will look! You could also only capitalize the first letter of the name if preferred; or make one side upper case and one side lowercase. My daughter watched me the whole time wondering when she could play with them; practicing her name on a piece of paper with her older brother. Here she is with her new felted balls. So sweet!